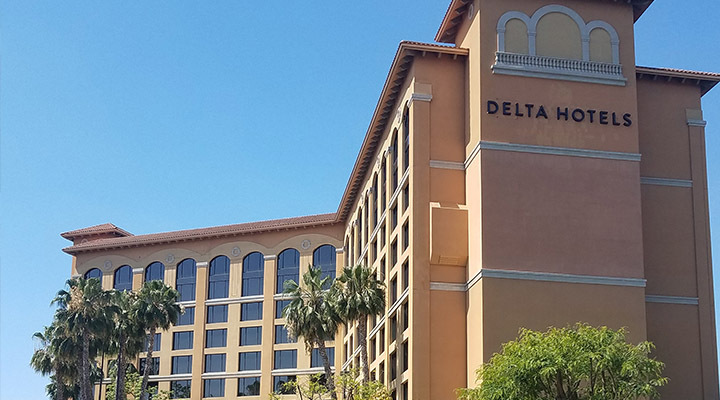 Located just a mile from the DISNEYLAND® Resort, this gorgeous Anaheim area hotel with spacious guest rooms will help you get away from it all. 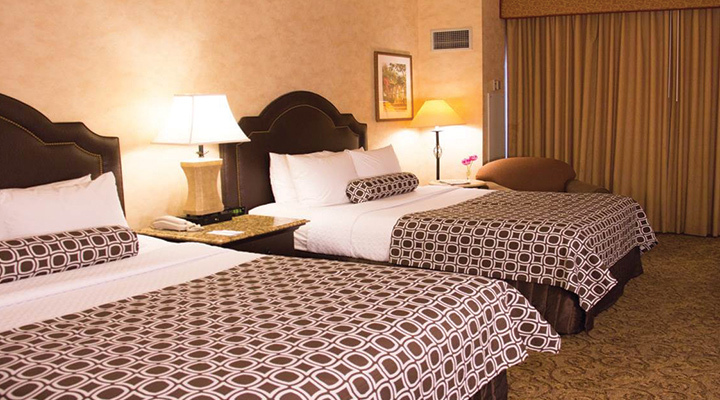 Exquisitely appointed guest rooms invite you to relax. Take a dip in the beautiful outdoor pool, grab a bite at their delicious in-house restaurant, and free hot breakfast exclusive to Get Away Today customers. Room remodel project through May 31, 2019. Updating carpet, furniture, lighting and fixtures. The furniture is a little beat up and the bathroom is clean but definitely older and rundown. Hotel overall was clean, breakfast was plentiful and good. The air conditioner wasn't very cold however I didn't talk to the front desk about it. I did however talk to the front desk and the valet twice about the limited handicapped parking. There are 4 stalls by the lobby and two a bit further away and they were all full. The front parking lot is used for valet and the staff would not let us use for handicapped parking even though there were over 15 stalls available and never used each day. I thought this was poor customer service. We had to park clear in back parking lot so I dropped my husband off each day or he hobbled to the lobby. Neither the valet nor the staff cared when I mentioned this. This was my first time at this hotel and I would stay there again! The free breakfast that was included was amazing! The omelets that the chef on hand makes are delicious! I was also very impressed with the shuttle! It comes so often that it was convenient to go back to the hotel to rest during the day. It also comes 50 minutes before park opening and 50 minutes after Disneyland park closing. The only thing that I didn't love about the hotel was that they didn't have a microwave in the room or one for public use, if you wanted one you had to pay $10 a day. Other than the microwave, I highly suggest staying at this hotel! Great staff, clean room, Breakfast buffet was very nice, Shuttle was on-time. I have stayed at this hotel multiple times. This was one of my best stays here. The staff was helpful, Samuel our server at breakfast was incredible, the front desk staff was considerate and friendly. I was impressed with the difference from or stay a year ago. Having the shuttle available every 1/2 hour makes Disney much more relaxed. I highly recommend this hotel. Great job Wyndham! Love this hotel and will definitely stay there again. The rooms were clean and beds were extremely comfortable. The breakfast buffet each morning was phenomenal and Jackie was our favorite and the best server. Had all the amenities we needed, great atmosphere, everyone was knowledgeable and helpful. The shuttle to Disneyland ran so often we didn't need to worry about getting a ride at any time. Beds were comfortable, breakfast was great traveling with 2 kids that are picky eaters they were both satisfied. Right across the street from a Target, shuttle to and from Disneyland. Great value for 3 day park hopper tickets included. It was my first time using this site and I'm glad I did. Staff at the front dest was super nice. Nice pool access to fitness room. I would stay here again. Some reviews said "old" the carpet was in the hallway but the rooms are fine for the value it's rally not that bad. Bunk beds were awesome! Shuttle was great! Pool was fun! Shower was falling apart - tub was cracked and faucet wouldn't turn off all the way. Customer service was excellent! The breakfast was so yummy - especially the omelets!!! Our room at the Wyndham was not very nice. Badly stained carpet, dirty walls and slow shower drain stand out. Parking is a little walk to the hotel. $15 per day "Hospitality Fee" each day was a little much. We have stayed in cheaper rooms that were much nicer. I would recommend that you pass on the Wyndham and pick another hotel. The hotel was reasonably priced with our vacation package that included our park tickets. However, they still charge you for your "free" full buffet breakfast as well as your "free" shuttle to and from the park and label it as additional amenities. I also had problems with them trying to push through my bank account 6 separate charges for the deposit that was supposed to only be $150. 5 of the 6 charges were not approved by my bank and caused my bank's fraud protection department to call me about the charges. IF they are going to advertise "Free", then they need to be upfront about what that means. To me free means FREE, not an additional charge at the end of my vacation! I have to be on a strict budget when I take my family on vacation and need to know exactly what I am paying upfront so that I can make sure I have that available. We were on a vacation celebrating my late sister's birthday and we took her children who had never been to Disneyland. The hidden fees put a slight damper on our trip. I also did not like the pushy hotel club sales people who pounce on you every time you enter the hotel, even after you tell them you are not interested. Delicious breakfast and nice rooms! Beautiful clean hotel with delicious breakfast buffet. Very nice pool. Helpful employees and convenient shuttle to Disneyland. Beautiful hotel, comfy beds, delicious breakfast, helpful staff!! I stayed at the Wyndham during Christmas with my 3 boys and sister. The hotel was absolutely gorgeous and magical with all of the Christmas decorations. The tree in the lobby was amazing. Staff was so helpful, courteous and accomodating. We needed a microwave and a rollaway bed and they did not hesitate to assist us with all of our luggage and other items we took with us. There was also a refridgerator and coffee maker in the room too. One of the most important features to me is the bathroom, and their bathroom was beautiful and clean. They had an amazing free hot breakfast with potatoes, pancakes, waffles, muffins, fresh fruit and omlettes made to order. A bonus was the shuttle to and from the parks that was included in our stay at the hotel. We loved staying at this hotel and will recommend it to all of our friends. Without doubt one of the favorite hotels I stayed during my time in Anaheim(Disneyland Trip)! Upon arrival we were warmly welcomed by the staff. The staff was extremely friendly, the restaurant very flexible (appreciate this!) and the breakfast chef restaurant deserves a special thanks. We had four great evenings here, which obviously also added up to the experience. Note, this is a 4/5-star hotel! The atmosphere is so special that it really felt like home to me. All respect for the general manager who does a great job here (Boris Banda); a true sample of excellent hospitality! Great Breakfast, comfy bedding & towels, but we had a flood. We stayed at Wyndham for 3 nights. After arrival and dinner across the parking lot at Joe's Crab Shack (not a fan) my husband took a bath. He pulled the plug and about 5 minutes later we discovered the entire tub full of water had drained into our room and the hallway. Maintenance arrived quickly and found us another room quickly. No fun to change rooms though. There is some aging that is evident, rust in the bathroom, the frig did not work. The bedding is comfortable, as are the towels. It is very quiet. The breakfast was fantastic! There is no charge for parking which was a nice perk. There is a free shuttle to Disneyland, another nice perk. However on our first morning the shuttle failed to show up, we lost an hour at the park. More TV channels did not work (screen showed "no signal") than worked. To sum up our visit I guess is that the breakfast was the highlight of the stay. We checked in after a long day and Maribel at the first ont desk was nice from the moment I began talking to her. She explained everything hung and was more than willing to answer all my questions. They breakfast in the morning had a lot of good options, and staff was very friendly. Our room was clean but half the channels stopped working on the tv the 2nd night we were there for the rest of the time. The staff was accommodating regarding extra towels and pillow cases but the sink and bath tub don't drain quickly so the water builds up. The staff was amazing regarding my daughter's bday. They took the time (because of Maribel) to make it a special day for her! They even made a 4th room key b cause she wanted one as well. I appreciate all the staff did for us during our stay, and we will be staying here again. We stayed for 5 nights and it was just mediocre. When we checked in it was clear our room had been smoked in so we had to change rooms. It smelled really bad. The 2nd room ended up being fine. The rooms were mostly quiet and you don't have much road noise so that was nice. The breakfast buffet was good and worth it. Our flight ended up leaving later so we asked for a late checkout (1:30 instead of 12:00) but the front desk told us the absolute latest we could check out was 12:30. They didn't have anywhere they were willing to let us keep our bags for that hour. I went to the front desk again the next morning and asked if a late check-out was possible and the gentleman said of course and that it wasn't a problem. In the end it worked out good, just weird how it all unfolded. One of the biggest let downs was the shuttle. This was a Disneyland trip for us. We had our magic morning passes and were at the bus stop 30 minutes before the first shuttle was supposed to show up at 7:40, except it didn't show up until 8:10, meaning we sat there for an hour. The shuttle drops you off at the furthest possible shuttle stop at the park. On other occasions the shuttle was already full when it got to our stop so we had to wait 30 minutes for the next one, or it wouldn't have room if you were trying to get on with a stroller. We were there in February/March when it isn't that busy, I can't imagine trying to get on one of the shuttles during a really busy time. Next time I'd just buy a ticket for everyone on the ART bus and just take them. 3 of the days none of the cable tv channels worked, the wifi only worked about half the time, but the hotel still charges $15 a day for use of the shuttle, wifi, gym access, etc. Location wise the hotel is great, there is a Joe's Crab Shack, Outback Steakhouse, and Red Robin all within a couple minute walk. The super target is just across the street which was really convenient if you had to go buy anything. Accommodations were nice, staff was very attentive and food was amazing! Clean and well cared for. Shuttle ran on time, and rooms were quiet. We knew our room would be smaller than most. We were surprised at the lack of ventilation in the room. Water dropped from the entry, outside the bathroom, when we showered. It felt like we got "stuck" in a sub par room because we were GetAway Today guests. We've never felt that way with our GetAway Today purchases before. We also had water coming through the edges of the window when it rained. It soaked our carpet and made the room smell. We called housekeeping, the front desk, and other extensions...no one answered. When we finally told them about the severe leaking they said "we don't know where the leaks are until it rains!" No "We are sorry. That was not what we want for our guests." Disappointing and we won't stay there again. I have no complaints about this hotel. It was a nice upscale business type hotel 3.5 to 4 stars.Bar and Restaurant downstairs, with a cafe that served Gelato and Coffees..thank you!! Rooms were good size, clean and well maintained, the mini fridge came in handy for water bottles. The full breakfast each day was awesome and had a great selection including an omelette bar, oatmeal, waffle, french toast and more, the kids loved that. The pool and hot tub area was nice as well. Several restaurants within a very short walk and a Target across the street which was great since we forgot some items. 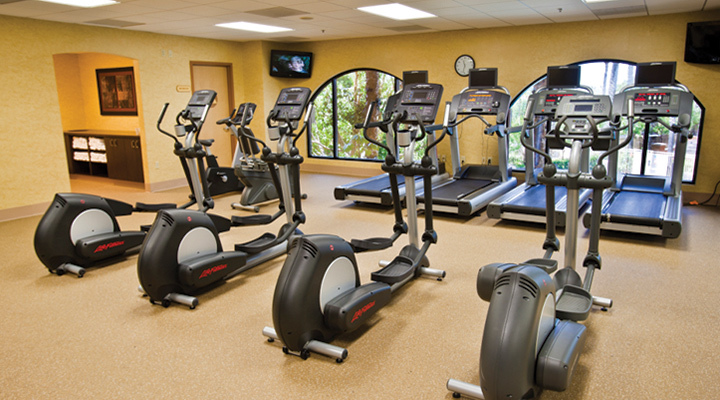 All areas of the hotel were clean and well maintained. Shuttle running to Disneyland every 30 minutes was perfect, it worked out for Magic Mornings as well. It was so quiet too, that is rare for a hotel stay and the beds are super comfortable.We would definitely stay here again. I love the hotel and the service I've gotten the last two times I've been. Previously, it has been a great value with internet, parking, shuttle, breakfast, and resort fee included which comforted me when I would pay a little extra per night to stay here but now that I see they are making you pay a $15/night resort fee, I'm not sure if I can afford staying here on my next trip :( The price always reached my maximum hotel budget but now it probably won't be doable and I am sad to have to pick another hotel which won't be as clean. 3rd stay in a year, room 221, rust in bathtub, cold water shower on thursday, disappointed that we had to pay the $15.00 resort fee this time, not optional. Free shuttle, free parking, and free breakfast ( that was pretty delicious; fresh omelets made to order as well as other delicious breakfast sides!) Lets face it anything free while on a Disney Vacation is pretty awesome! This is pretty much why we are booking again this year! 2017 Disney Land! Picked this hotel because we've stayed at other Wyndham resorts. I was happy that it came with free parking, free shuttle, and breakfast. When we arrived they didn't have our reservation and it took over 30 minutes to get us checked in. After everything was settled we went up to our room to find out they were doing renovations outside (which were noisy) until 7 p.m. However, I would have preferred they do some renovations on the inside. The bathroom didn't have a working vent, the wallpaper on the walls was coming apart at the seams, and there was children's writing onto he bathroom door. Overall, our stay was good. However, I would like to see better upkeep and maintenance on the inside of the rooms. I have no complaints about this hotel. It was a nice upscale business type hotel 3.5 to 4 stars. Rooms were good size, clean and well maintained. The full breakfast each day was very good and had a great selection including an omelette bar. The pool and hot tub area was nice as well. Several restaurants within a very short walk and a Target across the street. All areas of the hotel were clean and well maintained. Shuttle running to Disneyland every 30 minutes. I would definitely stay here again. Great price for so many amenities! We had the best time at Disneyland and this hotel was great! The staff were so helpful, the breakfast was delicious (especially the custom omelet station). The shuttle was always on time and very fast. They even let us store our bags after we had checked out so we could enjoy the afternoon in Downtown Disney. I should have known with so many free things, something was going to go wrong. We just got back from our vacation 1 week ago, and I will never stay here again. We arrived and our room was ready, but it smelled of sewer. We had black stuff coming out of our sink and I had to brush my teeth in the bathtub. Also, we waited an hour and a half for the shuttle both ways. Not enough room fo everyone many times. And to top it off, my husband's center caps were stolen off of his truck rims. When we went to tell the front desk they didn't care at all. No sympathy what so ever. He was like what do you want me to do about it. I will never ever stay here again and I will not recommend this place to anyone. I will only stay across the street of Disneyland or on property. I have stayed at this hotel for many years, before Wyndham bought it. We have always had a good experience with the staff in the hotel. Our rooms were always cleaned before we got back from the parks and there was always plenty of the free breakfast buffet. This last trip our room was very close to the elevators, which I will not do again. The bathroom was in desperate need of updating (the toilet didn't flush well, and there was peeling wallpaper). The mini fridge made this terrible loud ringing sound when the compressor turned on. I did not notify the staff of this, but I'm pretty sure they would have taken care of it. The free shuttle, breakfast, parking and WiFi are the reasons we keep coming back. More people are catching on to the hotel, so there was more difficulty in getting a seat on the shuttle, but all in all a good experience. Good Size rooms and Great Service! We just got back from staying at this hotel for a 4 day trip to Disneyland and it was perfect. We got a free night stay for staying over 3 nights, there was a Full Breakfast Buffet every morning including an omelette station....yum! We were able to get full before the park and save money on food that way, the parking is free at the hotel and offers a free shuttle every 30 min. to and from the park and it only takes about 10 min. to get there and back from the park. Very nice pool and the rooms were well maintained, nice beds and large bathrooms. We absolutely would recommend this hotel to anyone! We stayed for 5 nights. The staff were very helpful & friendly! Rooms were clean & beds were comfy! They were a little on the smaller side. The poolside cabanas were great as well as the poolside food & drink service. The shuttle worked out good & ran on time all week. Parking is free but not very convenient unless you want to pay $16/day for valet service. There are also several restaurants within walking distance & Target is right across the street! Overall a great experience & would definitely stay here again! Very nice and clean. Pool area/cabanas were excellent. Breakfast was awesome and plentiful. Beds/pillows were super comfy. Staff was very friendly and we very much appreciated the fact that our room was cleaned early on in the day rather than late afternoon. Last hotel we stayed at by Disneyland did not clean our room until late afternoon and it was very discomforting to come back to a messy/unclean room. Free shuttle was great - even ran on-time! The only drawback was we wish our room had a microwave to heat up those late-night snacks. Will definately stay here again. Stayed here for 5 nights. Nice good and friendly hotel workers. Clean hotel in great condition. Self-parking is a little far to the side/back with other hotels but is free and in walking distance. Wifi is free, fast and very strong signals everywhere even out to the front traffic junction!! Free shuttle rides to/from Disneyland but I didn't use/go there. Awesome buffet breakfast.. made me fatter. I will stay there again! At the end of the day, be sure to try that Stone IPA beer downstairs!!! The breakfast buffet was superb! Lots to chose from. The beds were the best feature of the room, very comfy. However, the rooms really need to be updated. Yes, the cooling system is outdated, the tub drain was slow and the toilet didn't flush very well. The parking was not convenient, far in the back and spaces are extremely small, but it is FREE. The shuttles can be crowded at peak times, but the drivers are friendly and the service is FREE. They offer FREE WiFi in the rooms, which other hotels charge $10 a day. So, the bottom line is -- if you just need a room to sleep in because you are gone all day at Disneyland, then this is a great place to stay. If you are looking for a spa resort, I recommend looking for something else. Very comfy beds, Outstanding breakfast buffet. Very convenient. Staff very helpful. Had a VERY noisy neighbor. Front desk took care of situation quickly. Excellent stay. Only con. Bathtub did not drain very fast, and TV remote did not work correctly, even though we did not use it very much. Will be back. I loved staying here on my trip! I went to Disneyland with a bunch of my friends and we really enjoyed this hotel. We had two rooms and they put us in conjoining rooms and it was so nice. Our rooms were very clean. The free shuttle, breakfast, and parking were so awesome and even though the hotel wasn't super close to the park, we were still able to walk to the hotel when we wanted to! Our waitress at breakfast was unbelievable. She remembered who we were every morning and remembered our preferences for drinks as well. I would definitely recommend this hotel to anyone. I will not be staying anywhere else in the future when we travel to Disneyland. The beds were amazing. We usually go home with sore backs, ready to sleep in our own bed, but this time we slept like babies. So comfortable. There's no loud, annoying AC unit. The one in there is very nice and quiet. Their breakfast buffet is top notch. Their shuttle to Disney every 30 min. is extremely convenient. Being across the street from Target is so helpful. And having 3 nice restaurants right in their parking lot is so awesome. This place is worth every dime. I've stayed at probably 6 other hotels in the area and this is my #1 choice. Not hopping around anymore. 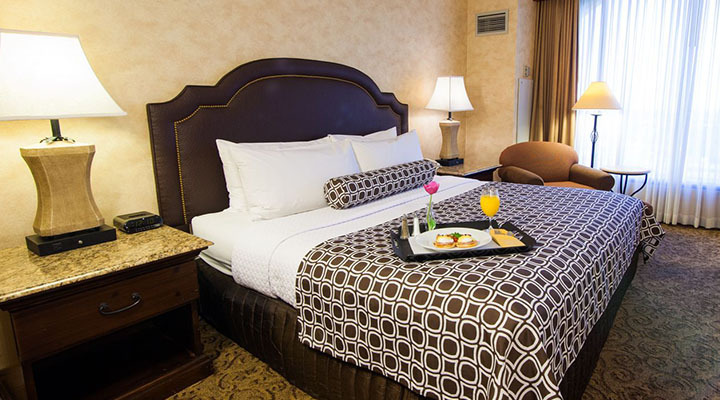 Wonderful hotel and great value with included, delicious hot breakfast buffet! 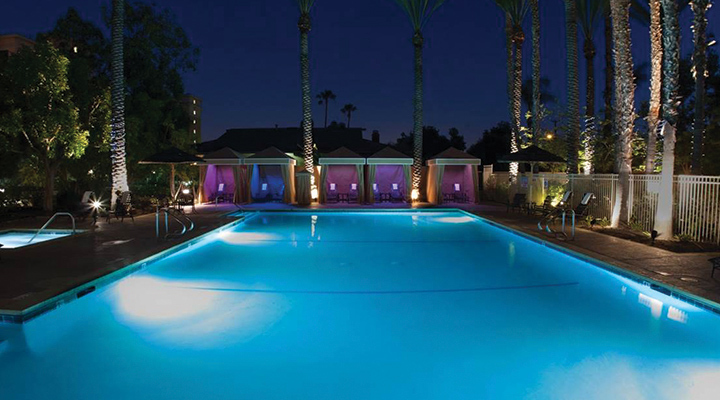 Our family really enjoyed staying at the Wyndham Anaheim Garden Grove. The rooms were very nice and tastefully decorated. All staff were extremely friendly, welcoming, and helpful. The beds and pillows were comfortable and rooms were quiet, which was great after spending entire days on our feet at Disneyland and California Adventure! We enjoyed the pool and hot tub, especially on our free day when we didn't go to the parks. (Only drawback was that people from the bar were smoking outdoors near the pool. I wish the smoking area was located away from the pool area so we wouldn't smell the smoke). Free shuttle service worked well for us, although we were there midweek so it was probably not as busy as it would be Friday-Monday. Sometimes the shuttles were pretty crowded or some people had to stand, but we were always able to get on. The free hot breakfast buffet and 4th night free offered by our Getaway Today package made this hotel a great value for us. We would definitely stay here again on a future visit to Disneyland. Thank you to Getaway Today and Wyndham for a lovely first Disney vacation experience! I loved staying here! It was a very nice Hotel. They have a shuttle right outside that runs every half hour to Disneyland and picks up from Disneyland as well. The room was clean and comfy and quiet. The breakfast buffet was AWESOME!!! Tons of good hot food to pick from. The staff was also very friendly. I was very pleased with this Hotel and it will definitely be a hotel I look into first when going anywhere!!! 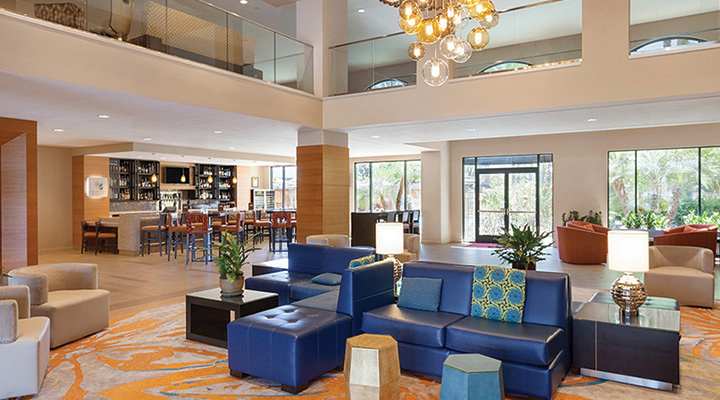 We had a great time staying at the Wyndham, from the breakfast, shuttle, pool and rooms. The stay was great! Nice hotel but shuttle needs improvement. Nice clean rooms, comfy beds, and descent hot breakfast. Shuttles are crowded, so you might not get on, even if you're early, as the shuttle picks up for another hotel as well. Room was clean, friendly staff and breakfast decent. Shuttle service needs to be doubled because they pick up two other hotel customers which makes for a full bus requiring people to stand and tempers to flare. Two shuttles should be sent consecutively or each hotel needs individual shuttle so pick and drop off times can be closer to what is reflected on their schedule. We had a very nice stay at this hotel. The property is new looking and the price is reasonable. It is a far walk from Disneyland, but the hotel provides a free shuttle that leaves every ½ hour starting one hour before the park opens and ending one hour after the park closes. We had a large room with 2 queen beds, a nice size refrigerator, and a large bathroom. They provide 2 free bottles of water daily. The breakfast is awesome. It includes cold and hot items; the made-to-order omelets being the highlight (tip: you can ask for over easy eggs, not just omelets). Parking is in the lot they share with the Marriott next door. When the hotel is busy, you might have to park closer to the Marriott. 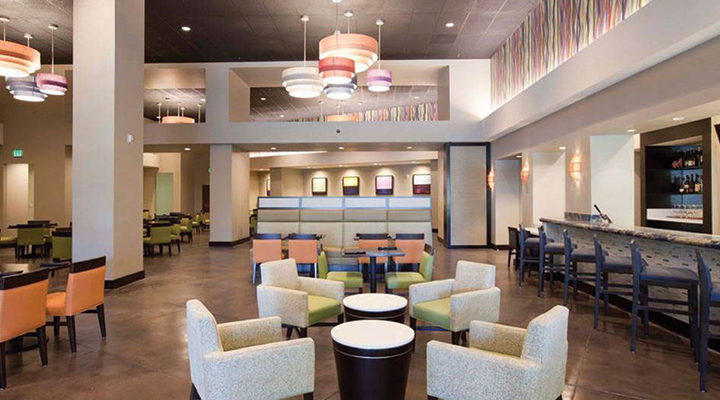 The hotel property is across from a Target and within walking distance of restaurants. Next time we plan a trip to Disneyland, we will be back at this hotel. My husband, 2 year old, 6 month old, and I stayed four nights at this hotel. Overall, it was okay. The breakfast was nice, but the shuttle service was terrible. We spent two days at Disneyland. The first day, we went out to catch the first shuttle of the day that was supposed to come at 8:10. We got outside at 7:50. We did not get on the shuttle until 9:00. The first shuttle was really late and then when it got there, the driver had no more room for our stroller. Two or three shuttles came after, mostly full- so again, no room for our stroller. It was really frustrating! We ended up driving to the park the next day, which was much less of a hassle... which is saying something because parking at Disneyland IS a hassle! We mentioned something to the front desk at checkout and they offered to reimburse us the $18 we paid for parking, which was nice. Luckily, we still had the receipt! Also, the parking lot is a bit of a joke. It's quite far away from the entrance of the hotel. Just a few minor problems with the room- our key wouldn't work after the first day, so we had to go have it fixed and the plug in the bathtub didn't work, so we just had to keep the water running to give the kids a bath. The beds were quite comfortable, however. We did like being next to Target, Red Robin, Outback Steakhouse, and Joe's Crab Shack. Next time, though, we will spend the extra money and stay close enough to the park to walk! Our family enjoyed staying at this hotel. The rooms were comfortable for a family of 4, but our water in our shower tub did not drain quickly on our first night's stay. My dancer daughter actually slipped in the tub getting in and bruised her hip from falling. We notified housekeeping and there were no further problems with the shower for the remainder of our stay. The room climate also needed to be tweaked because the controls did not work correctly. We were able to figure it out eventually and it did not negatively affect our stay. Breakfast was amazing! The hotel issues vouchers for each night's stay which was an excellent perk of booking through Get Away Today. There was fresh fruit, an omelette station, waffle station, scrambled eggs, bacon, sausage, potatoes, pancakes/french toast, cereal, oatmeal, and juice and coffee. My family enjoyed the friendly staff and delicious food! The hotel offers free shuttle to the Disneyland Parks, free parking, and free breakfast (as part of Get Away Today's plans). Close parking is limited, but the hotel offers a back lot to park behind the hotel next door. Target was right across the street which made it convenient to buy bathing suits for our kids to enjoy the pool. Joe's Crab Shack, Red Robin, Outback Steak House was right in the same area of the hotel which was very convenient! We would definitely book this hotel again due to the many conveniences and friendly staff! This hotel was great!! One bad this was the shuttle to Disneyland. It was late arriving the first morning but after that was on time for the most part. The breakfast was wonderful. Fresh fruit, cereal, eggs bacon and ever a omelet station. Well worth the money. If you need to take a taxi to Disneyland for magic morning it is $17. Parking was a difficult. I had to pay $16 per day extra for valet. The room was smaller than it looked and the sink was pretty small. The breakfast was very good which helped. Hotel & Restaurant Staff was Outstanding with an Excellent Breakfast (Our Favorite Part). GAT Is a Great Company Too. This hotel is not one that we will stay again. The parking is awful and not convenient to get in to the hotel after parking. They do not have rolling carts to help with your luggage unless you want to pay the valet guys to help you. We had 2 rooms and 1 of them had all kinds of problems. The beds were not comfortable. Our heater/air would not turn off. It went from hot to cold. They need to offer more shuttles to the park in the morning. It was PACKED every morning and it only runs every 30 mins. The bathroom in our room needed some extra attention. But the rest of the room and hotel were excellent! Coffee in restaurant was not great though - a 4 star hotel should have better coffee. We were thrilled with our trip package and the money we saved through Get Away Today! 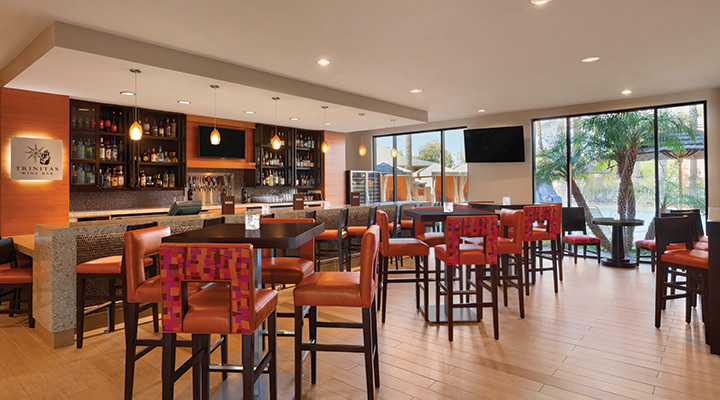 We stayed at the Wyndham Garden Grove in Anaheim. We got our 4th night free, free parking, no resort fee, free shuttle to and from Disneyland every 30 minutes and a free breakfast buffet, that we looked forward to every day because it was so delicious! The staff was awesome at the restaurant and the hotel as well. Get Away Today agents were so friendly, knowledgeable and helpful! They even called us to make sure everything was going the way we expected during our vacation. We will be booking our next vacation with Get Away Today for sure! Thank you so much!!! Still smiling!